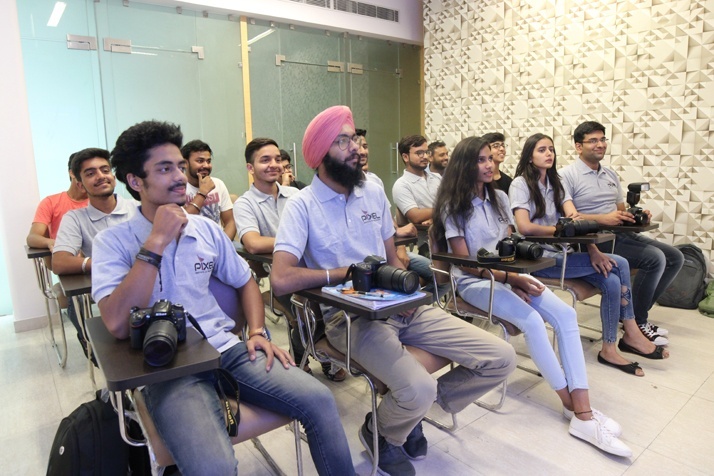 Pixel Photography Institute offers a profoundly authentic photography experience and world-class infrastructure that make us rank as one of the top destination for people of photography. We understand that the value of a course is considerably enhanced by the proficiency of the faculty and the facilities that the classroom offers. 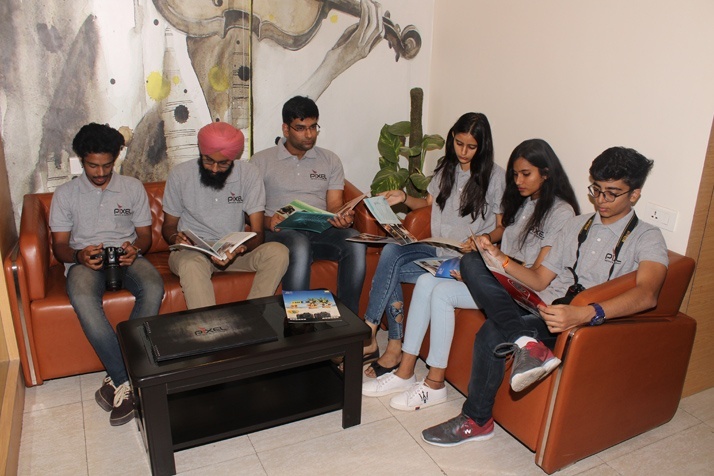 Our institute offers eager learners a chance to interact with the subject both theoretically and practically in classes equipped with a conventional classroom theatre and a HD Audio Visual setup. These classes are conducted by some of the most experienced and knowledgeable photographers in the field. The practical lessons encourage students to go out with their cameras and capture the perfect shot before returning to their editing software. The students then edit and produce the final image, making this a comprehensive approach to the art of capturing images. An enormous 2000 square foot campus spanning over two floors constitutes our institute. We have some of the best facilities out there including a huge lobby and library. One of the floors is occupied by classrooms, counselling rooms, and a waiting area. The other has a full-fledged professional studio for students. This is where the vast majority of practical training is done. It would be an understatement to simply say that we have a few achievers. Our star-studded alumni and current students have won many medals to make the institute proud. All these achievements are showcased here. This room exists as the institute’s professional assistance and guidance in resolving personal questions and answers. Pixel Photography would love to make it exceedingly clear that the coaching program that we conduct exists for the sole purpose of nurturing talented photographers and giving them the tools they need to emerge as leading experts in the field. We are prepared to answer any number of questions regarding the course, our faculties, or the facilities. Parents are welcome to get their doubts clarified here before enrolling their children in the course. We believe that there is no better way to learn than to experiment. Experimentation naturally brings a host of questions with it, some of which are difficult to find in books. This is why the waiting area is the ideal place for students to interact with their guides and learn new theories or techniques. Our state-of-the art student-teacher platform allows guides and their students to connect remotely. We ensure that no photography-related question squirms around for too long in the minds of our young hobbyists or professional photographers. An entire 1000 square foot area of pure ecstasy for a photography enthusiast is filled with cutting edge studio equipment. We have the Pantography lighting system, elinchrom FRX 400 lights, motorised paper backdrops, vanity mirrors, Light mirrors and much more. Fusing the right amount of practical implementation that effectively reflects and compliments the theoretical knowledge they have earned in the classroom is the best way to embed the information deep in the student’s mind. Our students enjoy trying out all the equipment housed in this floor. The teachers as well get a good estimate of every student’s strengths, weaknesses, and ability to translate theoretical concepts into practical work.